The New York Bill of Sale Forms legal forms that prove that there has been a legal sale and purchase of anything, between two parties and/or a business and an individual. The forms will provide information regarding the seller, the buyer and the change of ownership. As well the forms will provide identifying factors about the item(s) themselves. Most of the forms will require notarization. Boat Bill of Sale – This document will prove the sale, purchase, and change of ownership of a vessel. General Bill of Sale – This form is usually utilized as proof, between two private parties that a legal sale and purchase of personal items has been transacted. Gun Bill of Sale – An official contract for the transfer of ownership. 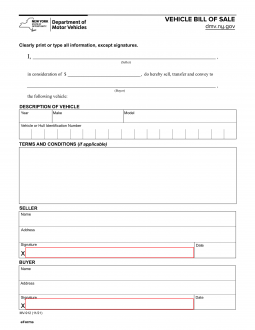 Motor Vehicle Bill of Sale – Required by the DMV in order to process new registration and license plates. The seller signature is required. If your vehicle has a lien on it, provide a certified copy of your vehicle title from the lien holder (this copy of the vehicle title and the certification of the title must be on the same piece of paper). Provide a statement from the lien holder on company letterhead that will identify the owner. It must also prove that the lien holder does have possession of the original title and is aware that the owner of the vehicle is registering the vehicle in the state of New York. The lien holder statement may not request notification of registration from the NYSDMV as notification service is not available.